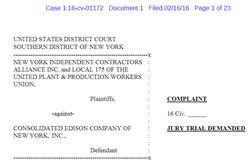 Labor Union Local 175 files lawsuit against Con Edison in the United States District Court for the Southern District of New York (Case 1:16-cv-01172) alleging antitrust violations. Local Union 175 and New York Independent Contractors Alliance Inc. of the United Plant & Production Workers Union filed a complaint in the United States District Court for the Southern District of New York (New York Southern District Court - Case 1:16-cv-01172) against Consolidated Edison Company of New York, Inc., alleging the utility violated antitrust laws by engaging in a conspiracy in restraint of trade. The Plaintiffs, New York Independent Contractors Alliance Inc. (“NYICA”) and Local 175 allege, as stated in the court document, (New York Southern District Court - Case 1:16-cv-01172), "Defendant, Con Edison has engaged in an ongoing conspiracy to lock up the New York City market for specialized asphalt paving work in the hands of Laborers International Union of North America (“LIUNA”), LIUNA Local 1010 and the group of contractors and subcontractors (collectively “contractors”) affiliated with LIUNA Local 1010, in violation of the federal antitrust laws. In an abrupt departure from its practices for the last ten years, Con Edison made a deal with LIUNA and LIUNA Local 1010 whereby Con Edison agreed to award asphalt paving contracts exclusively to contractors affiliated with LIUNA Local 1010"
The court document, which was filed on Tuesday, February 16, 2016 by plaintiffs' attorney, Edward M. Spiro, goes on to allege, "Con Edison has acted in concert and agreement with LIUNA and LIUNA Local 1010 to prevent and prohibit contractors with collective bargaining relationships with Local 175 from obtaining contracts from Con Edison to perform asphalt patch-paving and related work—that is, the restoration of asphalt patches and trenches that have been excavated to maintain electric, gas and steam lines. Pursuant to that agreement, Con Edison will award construction contracts only to contractors with collective bargaining relationships with unions affiliated with the Building & Construction Trades Council of Greater New York (the “BCTC”), such as LIUNA Local 1010." Also included in the document is the allegation that, "The agreement among LIUNA, LIUNA Local 1010 and Con Ed also creates a monopoly for asphalt patch-paving and related work in the hands of LIUNA, LIUNA Local 1010 and their affiliated contractors." The complaint seeks treble damages and injunctive relief to remedy the violation of the federal antitrust laws.